The position of the foot provides a fundamental importance in the way of pedalling. In fact it is the foot that transmits the strength to the pedals. An incorrect position, other than decreasing the engraved strength, may provoke health problems and useless muscular fatigue caused by the non agile way of pedalling. The correct position of the foot in relation to the pedals is determined not only by the adjustment of the heels, but also from the support of the foot inside the shoes. Therefore in order that all the strength exercised is transformed into motion, it is necessary that the feet are well inserted in the shoes. With the devices of PodOne and FootOne we are able to individually analyze the morphological characteristics of the foot and so realize the made-to-measure of the arch supports. These arch supports will then be adapted to the shoes so as to eliminate the problems mentioned above and to correct possible asymmetrics between the right and left part of the inferior limbs. 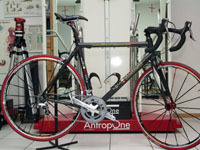 With the AntropOne we succeed in determining with high precision the anthropometry data of the cyclist. This data for example includes the height of the cyclist, the length of the single limbs and the lumbar flexibility. Moreover, by means of a digital camera we also determine possible asymmetrics between the left and the right part of the body which disturb the comfort of the position on the saddle. The relief data by means of the anthropometry analyses are elaborated by a complex software which calculates the ideal position the cyclist should have on the bicycle. The data are measured by the application of marked adhesives on the joints. For those who have physiological needs (health problems) and specific use (for example competitive), the results obtained by the anthropometry are used as starting points and are integrated with the dynamic tests. Two types of tests are possible. In the first one, one uses a sophisticated simulator called DynaOne, with which it is possible to monitor the cyclist while he practices his activity, visualizing on the screen the report of the cardiac pulsations and the strength developed. The position on the saddle is modified dynamically with the objective to compensate the corporeal asymmetrics and minimize the relationship, pulsations/strength. Therefore in a scientific and documentary way we are able to determine the ideal position of the cyclist, the one which gives maximum wellbeing and performance. The second test type is meant for those who don’t have any particular needs, the test takes place on the rolls with ones own bicycle. Here the visual evaluation, the skill and the experience of the operator allow the setting up of the theoretical parameter obtained by the anthropometry. With ClipOne it is possible to regulate the heels in a rapid and precise way, monitoring the efficiency of the push on the pedals immediately. The person is positioned on the bicycle with the heels loosened and inserted in the pedals. The shoe is tightened by the special supports on the point and the heel. Moving the shoe and continuing to press on the pedal the momentary push is visualized on a display while another display visualizes and memorizes the maximum push reached. It is, therefore, possible to look for the most efficient push point. With this instrument one is able to verify that the use of the arch supports increases in a sensible way the maximum push as well as diminishing the muscular tensions and stabilizing the position of the back. Would you like to know the exact parameters of your frame or even the relative dates of your position on the bicycle, for example the height of your saddle? We are able to measure it with an inferior precision to the millimetre with ReportOne. Have you changed the components and would you like to re-establish the original position? It is not a problem with ReportOne. 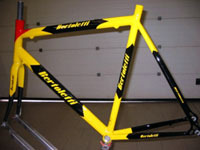 Would you like to verify if the frame measurements (such as height, the length and the various angles) really corresponds to the specific supplies of the frame maker? With ReportOne verifications to the millimetre are possible. ReportOne is also a checking where the operator takes the ideal measurements obtained by means of the test or anthropometry and therefore adapts your bicycle (saddle, pipe) until the real position coincides as much as possible with that of the ideal one. The data relevant to the ideal position projected with the dynamic test and the data of the anthropometry are used to correct the position of the cyclist on the saddle. The data are taken back in a millimetric way on the bicycle with ReportOne. Above all the position of the saddle and the pipe of the handlebars are fitted in a way to coincide with the ideal position, unfortunately often it is necessary to substitute the pipe connected to the handlebars and/or the pipe to keep saddle up. Adjust the thickness of the band on the handle bar. Adjust the alignment of the curve of the handlebar. Regulate the position of the brake lever left and right. Determine a specific inclination of the saddle. We are able to provide information and technical advice on all of the cycling components. Moreover we are able to order a vast range of materials with the most renowned international firms (Shimano, Campagnolo, Mavic and all accessories supplies). Ask us for an estimate without any obligations. 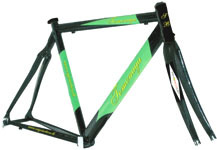 As regards the frames we have good connections with these partners who supply us with frames made-to-measure exactly according to our specifications. We are also at your disposal in this case.